Hey everybody, it’s Claire Temple! She’s taking those self-defense lessons from Colleen, teased at the end of Daredevil season 2! Can she help elevate this material? She bails after making awkward smalltalk with Danny, but we see her again after the best martial artist in the world, the Living Weapon, the Immortal Iron Fist nearly gets a bystander killed while fighting another henchman in a shipping container. Also, she keeps almost saying that she knows people who can help and have ninja experience, but no one lets her get a word in edgewise. The Good: OK, I did like the over-the-top send-up of pharma reps that opens the episode. Yeah, it’s heavy handed, but at least the show is winking at us after being so ponderous for the first 4 episodes. Also, Ward flipping off the unseen and previously unknown surveillance cameras is a fun moment. The Bad: Oh my the forced date. Even if Danny the character who is emotionally 10 years old doesn’t realize how terrible this is, the show itself should punish him for it. At least Claire recognized how uncomfortable Coleen was and inserted herself, but then she left. And how is Danny’s bland statement of sympathy an admission of guilt? And really, the central conflict of the episode (season?) is set up to protect Danny’s company from liability for producing synthetic heroin? Don’t go to the police! I’m going to fight this vigilante style to protect shareholder value! The shipping container fight was a step up from the records room fight two episodes ago, but I still don’t understand how random mooks are able to land a blow on the Living Weapon Immortal Iron Fist, who got his powers by punching a dragon in the heart. The Other: Joy has an Are We The Baddies? moment with her brother while waiting for the elevator. The Hand does like moving people around in shipping containers, don’t they? Doors Destroyed this episode: 1, series total 2. Oh my god, I just realized that the showrunner of Iron Fist is the same one who ran Dexter into the ground. That explains so much!! This episode, I think, really typifies the problems this show has. There are so many gratingly awkward moments (the take out dinner for one) and idiotic plot points that I wonder if the writers even read what they are writing. Was there a second draft? Did they just scoop together a loose collection of post-its from a brainstorming sesh and start shooting? For example Danny and Colleen going to take pictures of the shipping containers. I'm not sure what they thought they would see? They are disappointed that all they see are boxes, but never bother to look in any of them. It literally makes no sense. Even if the Hand was openly shipping drugs in those containers they would have to store them in some sort of box inside, if only for loading and unloading purposes. Were they expecting to see crates stamped "DRUGS" in all caps? It's a half formed setup to give Danny an excuse to punch his way out of a shipping container and that is it. Maybe if Luke shows up to recreate that Doakes meme this mess would all be worth it. Danny's utterly obnoxious reaction to Colleen and Claire's lesson is what finally convinced me that the show was unredeemable. Maybe if one of them had said "Not now dear, the grownups are busy". Even if interrupting wasn't a thing in Kun Lun, he would have been familiar with the idea before the plane crash. I doubt anyone is here, but a specific thing really bugged me in addition to the episode being the worst of the six I've watched. Colleen gets a bullet in her windshield while following the truck. 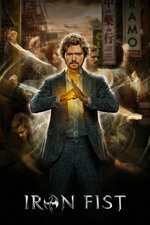 Iron Fist is fighting in a closed space within the trailer. The bullet is shot toward the back, but it has to travel through the inner wall of that room, then get past the the boxes and through the closed metal door of the trailer, and be shot at the right angle to hit a car lower than the truck bed. I felt as though the production team gave me the finger. So bad that I'm afraid I misinterpreted it.